A stylish alternative to plain bib aprons, this Choice apron boasts a curved silhouette and strong, low ties for an adjustable, superior fit. Plus, its kelly green coloring adds a vibrant pop of color to restaurants, bistros, cafes, and catered events. Protect your barkeep or waitstaff from inevitable messes while changing kegs, taking orders, or serving customers with this versatile apron! As a bartender or server, we know you're gonna wanna see all the tips this St. Patrick's Day! 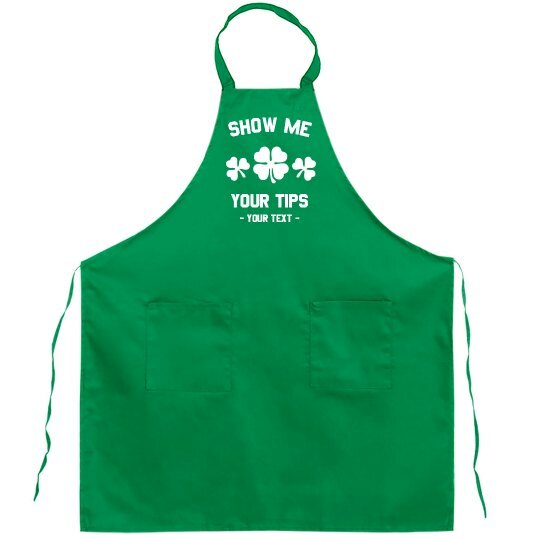 If you're stuck working, rock this funny and festive apron to let your customers know that you deserve to see some tips. Personalize it with an extra line of your own text - add some more Paddy's Day humor!